Carbon dioxide, or CO2, is a non-polluting gas that is part of the carbon cycle. It occurs during biological and physiological processes, such as respiration and decomposition. This greenhouse gas (GHG) is produced anthropogenically through the combustion of fossil fuels in industrial processes and in our daily life (including natural gas, gasoline, diesel, and coal), via concrete production and deforestation, and due to changes of land use for agricultural purposes or through degradation; natural ways of producing CO2 emissions include volcanic activity, geysers, and changes in solar radiation (Source IPCC). Several causes have led to the increased concentration of this gas into the atmosphere over the past century, with the consequent effect on the planet called “global change” by experts. 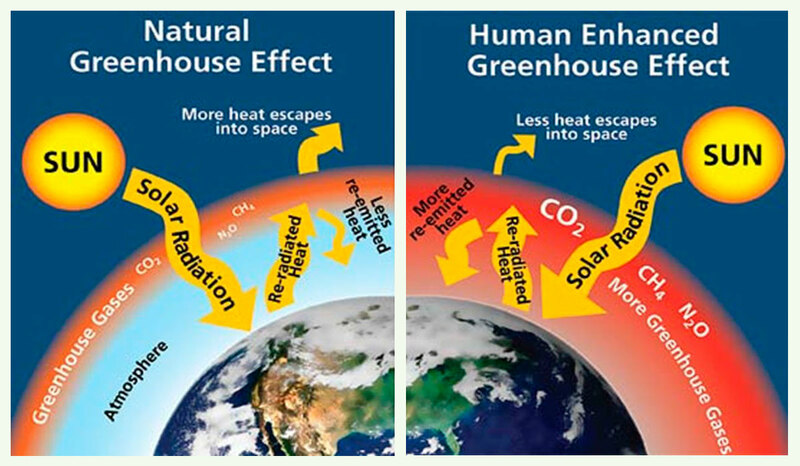 This process is based on effect of “greenhouse gases “, which at high concentrations, it prevents part of the radiation that comes from the Sun to the Earth to return back out into space, thereby provoking processes of internal heating in the atmosphere, with direct consequences on the climate. Living beings are made largely of carbon. 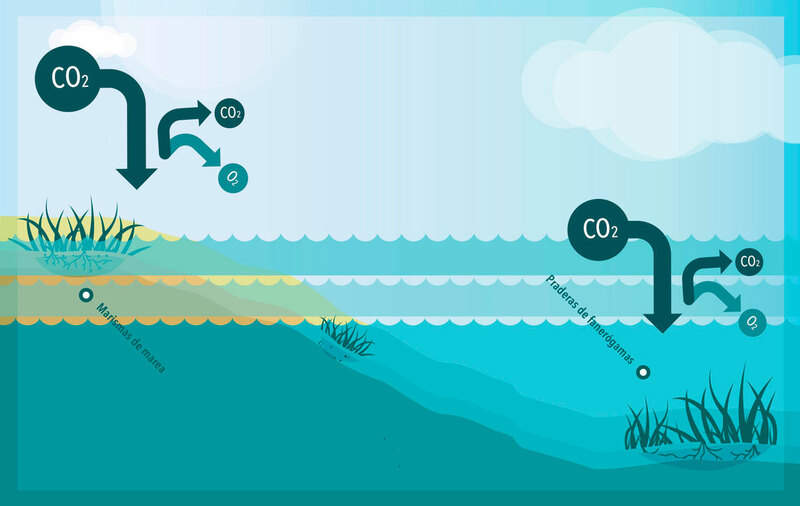 While animals expel carbon (inhaling O2 and expelling C02) and other gases, such as methane (CH4), in our metabolic processes, plants and other photosynthetic organisms, such as algae, known as primary producers, do the reverse: they perform photosynthesis, using the CO2 diluted into the atmosphere or into the aquatic environment where they live. These primary producers incorporate this carbon into their supporting structures (leaves, stems, roots, etc.) and expel O2 into the atmosphere or the aquatic environment. Likewise, in the process of respiration, they emit CO2, but in much smaller quantities than they absorb. In other words, photosynthetic organisms absorb much more carbon than they emit. The longevity of certain primary producers , which can live for hundreds or thousands of years, constitutes a major factor in keeping the carbon that they have assimilated during their lifespan within (and under ) their structures , thereby preventing this carbon from being available in the form of CO2. This natural carbon “sink” is “sealed” by the habitat or living ecosystem, and the carbon retained is, therefore, outside the atmosphere. These organisms therefore naturally “sequester” carbon from the atmosphere and contribute towards reducing the amount of CO2 in the atmosphere. 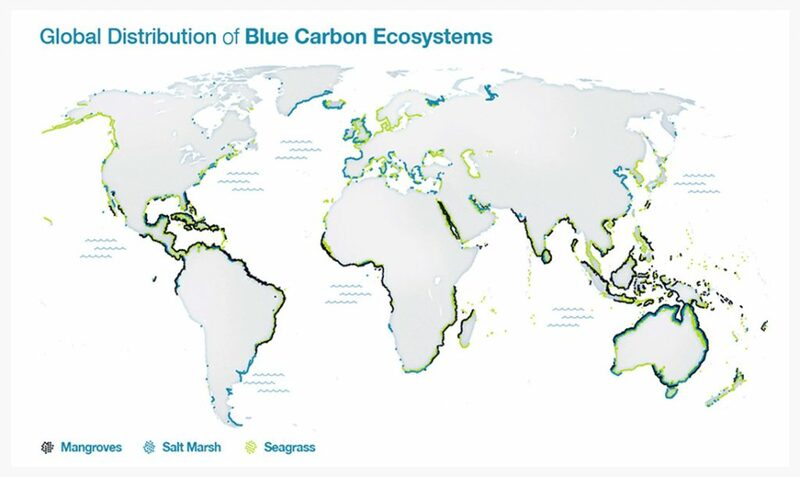 The so-called blue carbon is that captured by the world’s oceans and coastal ecosystems, different from the green carbon that is stored by the forests and their soils. Carbon (blue) captured by organisms living in the oceans is stored in the form of biomass and sediments, mainly in mangroves, tidal marshes and, seagrass beds. Therefore, the ecosystems responsible for the formation of these blue carbon sinks have a significant impact on climate change by mitigating the effects of the increasing CO2 emissions, both at local and global levels. Moreover, although the biomass of the organisms responsible for the formation of blue carbon is much lower than those responsible for green carbon, it is estimated that they absorb almost the same amount of carbon annually as terrestrial photosynthetic organisms, thus representing extremely efficient and effective carbon sinks, baptized as BLUE CARBON SINKS. 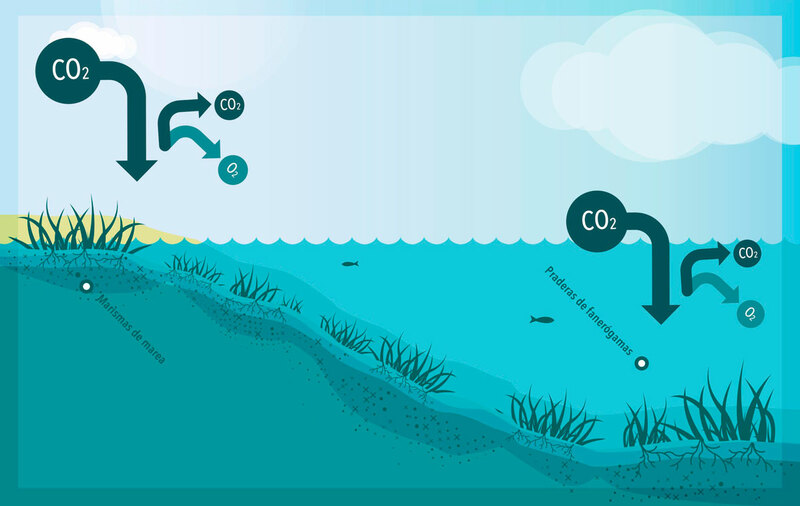 The degradation or loss of these ecosystems can convert them into sources of carbon emissions. This is another reason for their conservation. CO2 (carbon dioxide) is the main greenhouse gas. Emissions (burning fossil fuels) are increasing CO2 in the atmosphere, causing climate change. During photosynthesis, plants take CO2 from the environment in which they live, and use carbon (C) to form their structures (leaves, stems, roots …), emitting oxygen (CO2) and some CO2 during respiration. 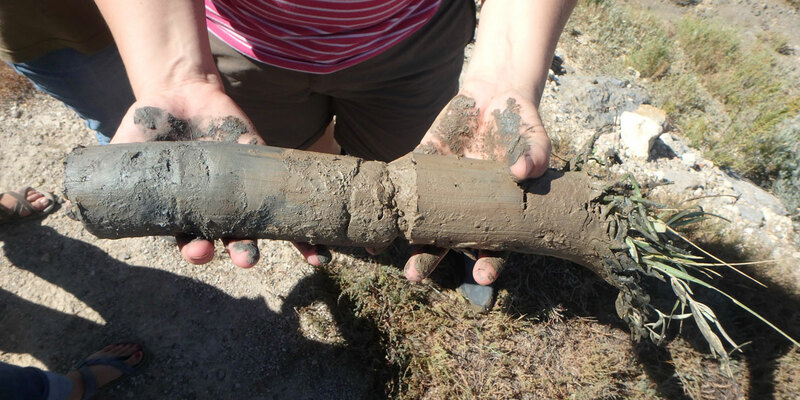 Over time, ancient roots, organism residues and suspended organic matter, largely carbon formed, are “sequestered” beneath the plant, creating a growing layer. This layer, which we call carbon sink, is “protected” or “sealed” by the marsh or meadow, as long as it remains alive. The carbon retained by these ecosystems is the so-called blue carbon and is vital for mitigation of climate change by continuously and continuously withdrawing CO2 from the atmosphere. Many of these coastal habitats are already protected by HABITAT DIRECTIVE 92/43 / EEC of 21 May 1992 on the conservation of natural habitats and of wild fauna and flora and their successive updates. 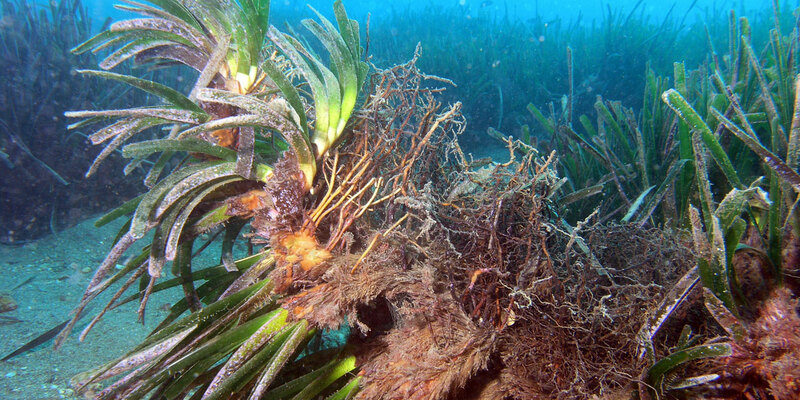 The habitat 1120 – Posidonia oceanica (Posidonion oceanicae), which is also the only strictly marine habitat, is considered Priority Habitat. 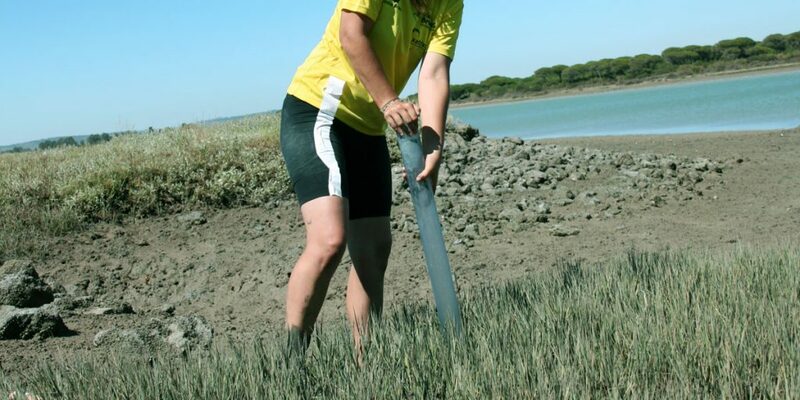 The others seagrass meadows as well as all those included in the tidal marsh may be represented in the following habitats of community interest: habitat 1110 – Sand banks permanently covered by shallow marine water; habitat 1140: tidal flats; habitat 1320: Grasslands of Spartina (Spartinion maritimi); Habitat 1310: Annual pioneer vegetation with Salicornia and other species of muddy or sandy areas; or habitat 1420: Mediterranean and thermo-Atlantic halophilous scrub (Sarcocornetea fructicosae). Despite the benefits and services offered by these coastal ecosystems, we can say that they constitute one of the most threatened ecosystems on Earth. It is estimated that, in recent years, about 67% of mangrove swamps, 35% of tidal marshes, and 29% of seagrass beds have been lost worldwide. Thanks to their capacity in carbon sequestration and storage, blue carbon sinks have begun to be considered in climate change mitigation strategies under the United Nations Framework Convention on Climate Change (UNFCCC). This step is fundamental for their inclusion into the carbon markets, and thus encourages actions for their conservation, maintenance, and restoration. This environmental management tool would therefore favour the mitigation of climate change. Despite being part of the NATURA 2000 NETWORK, many of these habitats are being lost at a rate four times higher than the disappearance of terrestrial forests. In Andalucía, a law on climate change (a draft law at present) is being passed. 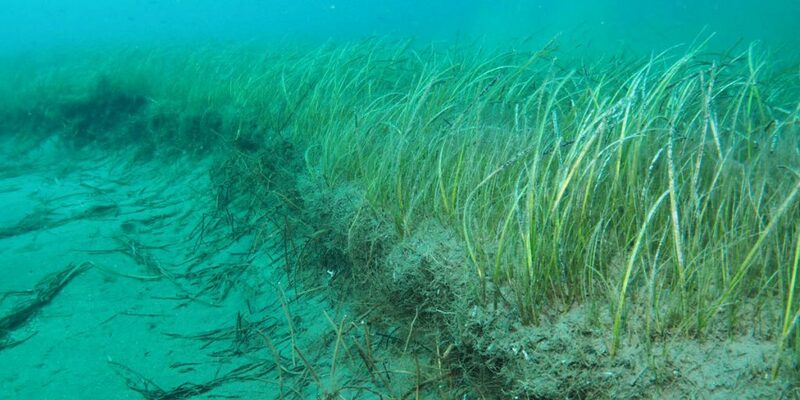 The future law will cover the Andalusian System of Emission Compensation (SACE) and its Projects Catalogue, and will collect the “Carbon Sinks” in a specific section with the objective of including the conservation and restoration of, among other ecosystems, seagrass beds and tidal marshes. 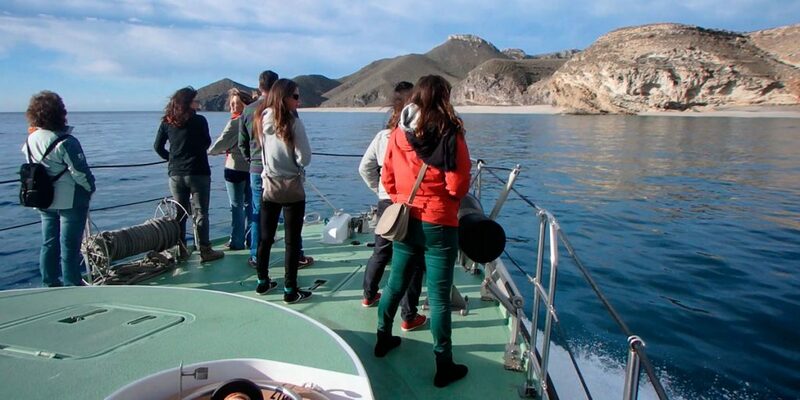 El proyecto Life Blue Natura viaja a Almería de nuevo para participar en un Bioblitz, un “Maratón de Biodiversidad”, cuyo objetivo es registrar el mayor número de especies posible en un lugar y durante un tiempo determinado. Am- hace referencia a los aspectos Ambientales que se puedan derivar de este inventario de Biodiversidad.